You wouldn't think that Lorde is only 17 until she began her set, giggling as she looked out at the cheering crowd. Lorde is unbelievable live. With lyrics way beyond her years and a very transcendentalist take on life, her energy is radiant. Performing at the Greek Theatre in Berkeley for her first time ever, she blew the roof off a roofless venue. 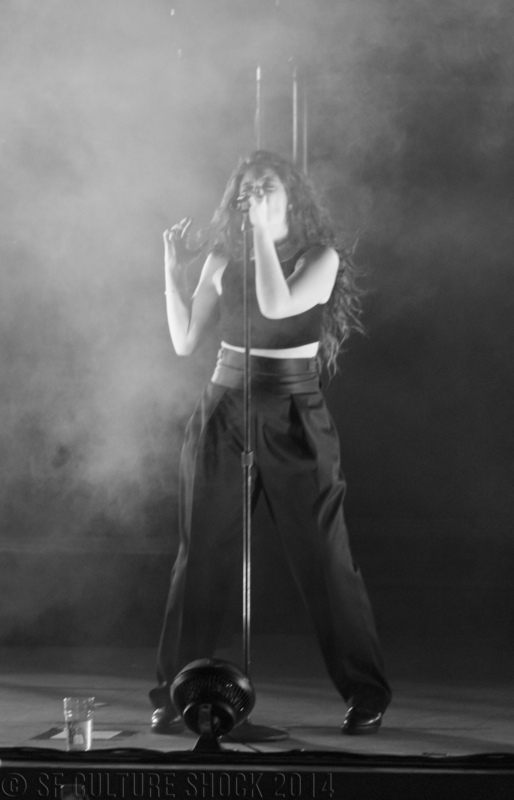 She started the night off with songs from her debut album Pure Heroine, which resonated with the fanbase who knew nearly all the words to every song. 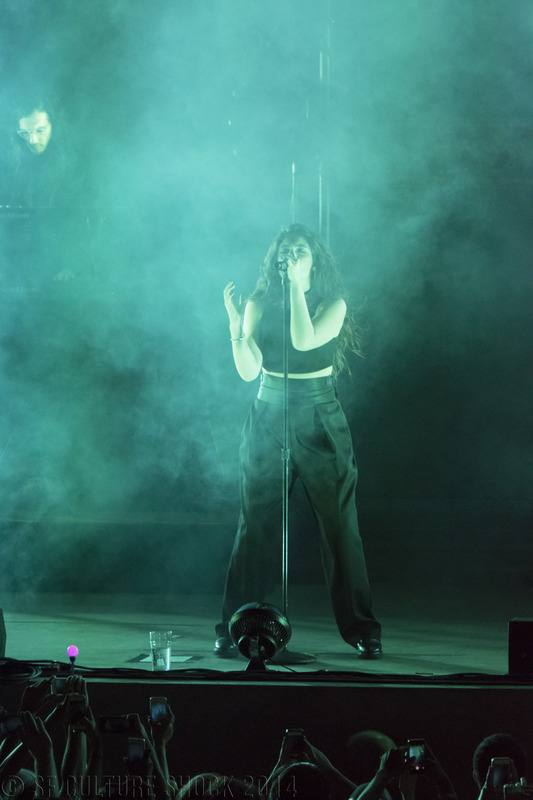 Lorde emerged in high-waisted business pants, a crop top, and a blazer, an atypical outfit for the average teenager, but for her it just seemed to work. The crowd swayed and chanted the lyrics to newer songs like “Glory and Gore” and “Buzz Cut Season.” The test of the true fans came when she sang “Biting Down,” a song from her first EP that also featured “Tennis Court.” Between every verse she added her signature cathartic dance moves, which only made her performance that much more entertaining. 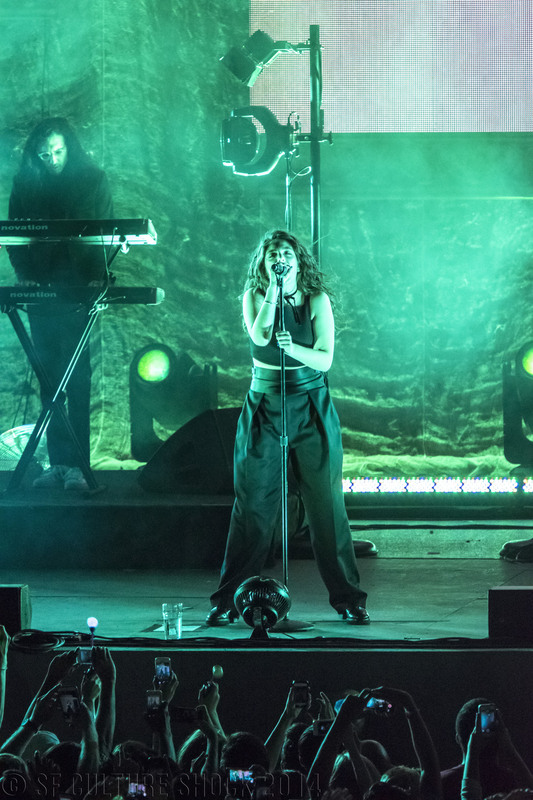 A strong advocate of living in the now, Lorde stopped in the middle of her performance to reflect with the audience on the crazy year she’s had. After “Royals” hit the radio last summer, her life became a whirlwind of tours, interviews, and thousands of fans. Looking out into the crowd she mentioned that she turns 18 in almost a month. “Thanks for helping me grow up,” she joked. The night went on and Lorde made a quick change into an all-white pants suit with a crop top and coat. She covered the beginning of Kanye West’s “Flashing Lights,” getting the audience riled up for the second part of her performance. After rapping the first two lines she transitioned into a livelier beat playing “Bravado,” one of her most popular songs. She had the entire crowd entranced by her lyrics, her tune, and her wonderful dance moves. Her band consists of a drummer and a keyboardist, making the soul focus of the concert her magical voice. She changed once again into an electric red outfit, which featured a cape and gold laurel wreath headpiece. Lorde truly looked royal in the stunning costume. She told the audience that she was going to play a song live for the first time ever and it was no surprise when the sweet hums that mark the beginning of “Yellow Flicker Beat” began to fill the theater. Released just days before the show, Lorde performed her newest song for the upcoming movie Mockingjay: Part 1 movie of the Hunger Games series. Her dance moves intermixed with her sweet, chilling vocals created a phenomenal atmosphere for the audience. In Lorde’s closing songs she sat at the edge of the stage, then stood up for one of her final numbers as confetti with her face on it floated down onto the crowd. The power of the Lorde was all around us and left me only wanting to experience it all over again.